Browse through the Positive Change Training System, a library of strength based personal and professional development courses. You can choose from free or paid courses and you’ll have access to a community space where you can connect and collaborate with others. You are invited to our free training webinar called “Overcoming Adversity – Change and You“. 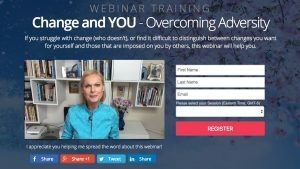 If you struggle with change (who doesn’t) or find it difficult to distinguish between changes you want for yourself and those that are imposed on you by others, this webinar will help you with content from one of of our best courses.